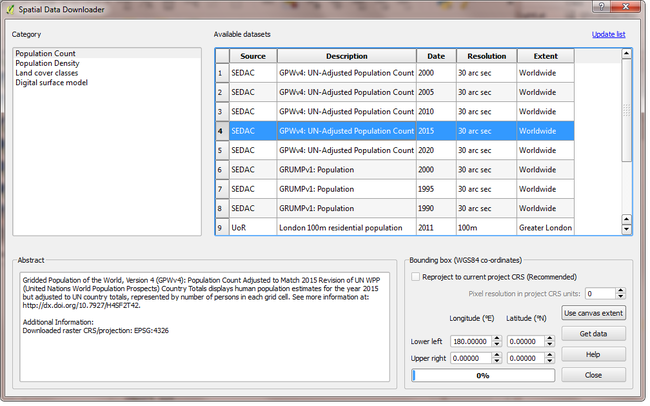 The Spatial Data Downloader downloads geo-datasets useful for UMEP applications. Only the necessary section of the data is downloaded, so that disk use and download time are minimised. Information about the selected dataset, including citation information. The downloaded data is saved in its original CRS by default. This option reprojects the saved data to the project CRS and performs resampling, the resolution of which is controlled by the “Pixel resolution in CRS units” box. Refreshes the catalogue of available datasets. This is also updated when QGIS starts. © Copyright 2018, Fredrik Lindberg, Ting Sun, Sue Grimmond, Yihao Tang Revision e1ad0a52.